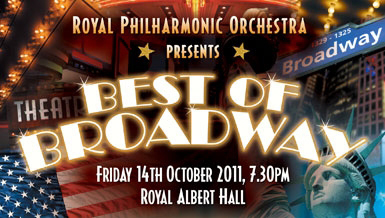 On Friday 14th October at 7:30 pm you can hear the Best of Broadway at the Royal Albert Hall. The Royal Philharmonic Orchestra and vocalists Ria Jones, Mary Carewe, Graham Bickley and Michael Dore are presenting numbers from favourite West End shows including Wicked, Mamma Mia!, Chicago, Les Misérables and many, many more! Plus there is a special tribute to the MGM musicals featuring The Wizard of Oz, Kiss Me Kate, Annie Get Your Gun, Easter Parade and High Society. David Firman is the Musical Director for the Concert.